A new analysis of 15 years of NASA satellite cloud measurements finds that clouds worldwide show no definitive trend during this period toward decreasing or increasing in height. The new study updates an earlier analysis of the first 10 years of the same data that suggested cloud heights might be getting lower. Clouds are both Earth's cooling sunshade and its insulating blanket. Currently their cooling effect prevails globally. 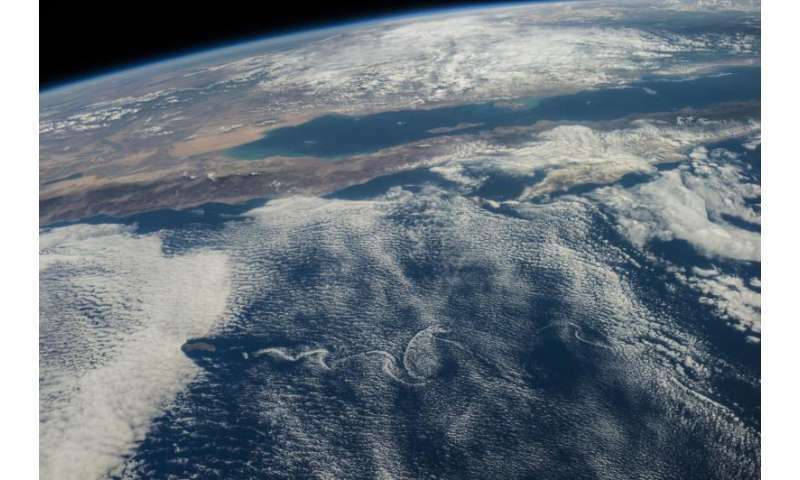 But as Earth warms, the characteristics of clouds over different global regions—their thickness, brightness and height—are expected to change in ways that scientists don't fully understand. These changes could either amplify warming or slow it. Pinning down some of the uncertainties around clouds is one of the biggest challenges in determining the future rate of global climate change. The study used data from the Multi-angle Imaging Spectroradiometer (MISR) instrument on NASA's Terra satellite. Using nine cameras pointing at Earth at different angles, it records images in four visible and near-infrared wavelengths. The images allow researchers to distinguish the amounts, types and heights of clouds. Launched in December 1999 with a planned six-year mission life, MISR was built and is operated by NASA's Jet Propulsion Laboratory in Pasadena, California. Five years ago, Roger Davies, Buckley-Glavish professor of climate physics at the University of Auckland, New Zealand, and a colleague analyzed the first 10 years of MISR data. Their results suggested that cloud heights had lowered over the decade, raising the possibility that climate change effects on clouds might already be discernible. In the new study published recently in the Journal of Geophysical Research - Atmospheres, Davies and colleagues from JPL incorporated an additional five years of data into their analysis and reanalyzed the first 10 years. In particular, they were sleuthing for factors related to the instrument or image processing that might have made clouds appear artificially high in the first years of the mission. The researchers checked several possible factors and found they were all insignificant except one, a change in the Terra satellite's equator-crossing time. Terra crosses the equator at the same local times of day on each orbit. Its morning equator-crossing time was originally planned for 10:30 a.m., but due to launch timing, Terra initially crossed the equator at 10:45 a.m. instead. To bring it back to the planned time, spacecraft operators slowly adjusted its orbit over the first two years. Davies knew this time change wasn't significant in terms of clouds themselves—clouds don't change much during 15 minutes in mid-morning. In the new analysis, however, he discovered that the change was significant in a different way: it reduced the ability to detect high clouds in the MISR images by reducing the occurrence of sun-glint. Sun-glint appears in satellite images when sunlight reflects off Earth's surface at the same angle that the satellite is viewing the surface—as if Earth's surface were at the point of a giant V and the sun and satellite were on the two arms of the V. Thin, high clouds are easier to detect in the presence of sun-glint, so the first images with more sun-glint appeared to have more high clouds than the later images. Once the researchers corrected for the sun-glint issue and added the new years of data, they saw no statistically significant trend in cloud height over the 15-year period. Cloud heights do, however, vary considerably from year to year in connection with weather and climate phenomena. La Niña and El Niño events have the strongest effect, with the 2008 La Niña lowering global clouds on average by 130 feet (40 meters) and El Niño events pushing them upward. Beyond that, the researchers found differences in Southern Hemisphere and Northern Hemisphere cloud behavior and regional correlations that warrant further investigation. With cloud heights naturally varying so much, Davies thinks it could take another 15 years of data to spot any possible global effects of climate change. "All we can say at the moment is that the global trends in cloud heights, if they are there, are being swamped by El Niño-La Niña fluctuations," he said. "It will take a lot longer till we can tease out these long-term trends." "With cloud heights naturally varying so much, Davies thinks it could take another 15 years of data to spot any possible global effects of climate change. "All we can say at the moment is that the global trends in cloud heights, if they are there, are being swamped by El Niño-La Niña fluctuations," he said. "It will take a lot longer till we can tease out these long-term trends." .............in the meantime, the safe thing to do will be to assume El Niño-La Niña fluctuations are caused by AGW? Of course there is nothing scientific about such a conclusion as pointed out in the article, but such a narrative creates hysteria among certain AGW Enthusiasts & is the intended conclusion here. You presume that cloud heights are the only feature of global warming. I find it amazing that someone can take an article discussing how the natural La Niña/El Nino cycle could be masking any change in cloud height, and somehow get out of that any discussion on the causes of the ENSO cycle. His/her comment suggests that, along with being innumerate, Benni is also illiterate. It's amusing to see the #climatecranks whine about how "teh sciensetis" are all "fanatics" and then watch them react to a paper that says the findings are ambiguous. When it doesn't go their way, "teh sciensetis" are "chicken littles" or "warming alarmists;" when it's even the slightest bit ambiguous, they jump up and down screaming, "we tolja so!!!111!!one!" One cannot possibly try to hold both these positions without one's fundamental and deliberate dishonesty being incredibly obvious. Oh NOSE!! The sky is falling....wait...the clouds are not getting higher....wait....the Arctic is NOT emitting more methane....wait...the globe is actually cooling....wait...the Antarctic is actually cooling and gaining mass....wait....what lies must the AGW Cult fabricate now to feed their ignorant hungry Chicken Littles.